Tuesday Treasures! 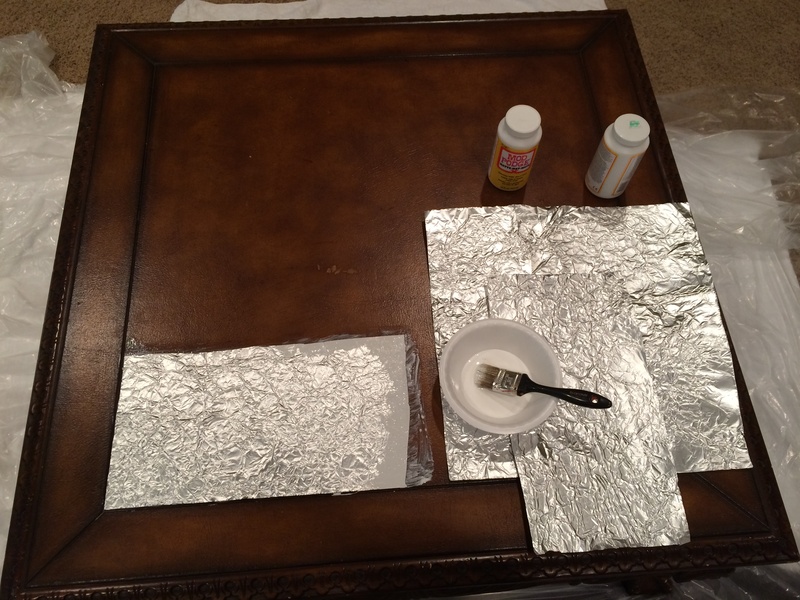 Coffee Table Makeover with Aluminum Foil, Homemade Chalk Paint, and Metallic Glaze! About 99% of the furniture in my house has come from Craigslist or garage sales. I can rarely justify buying something new when I can buy something used and for much less money and make it exactly how I want it. I’m not always sure what I’m going to do with a piece when I buy it, however. I usually let it sit for a little while until I finally decide what color/style I want something to be. 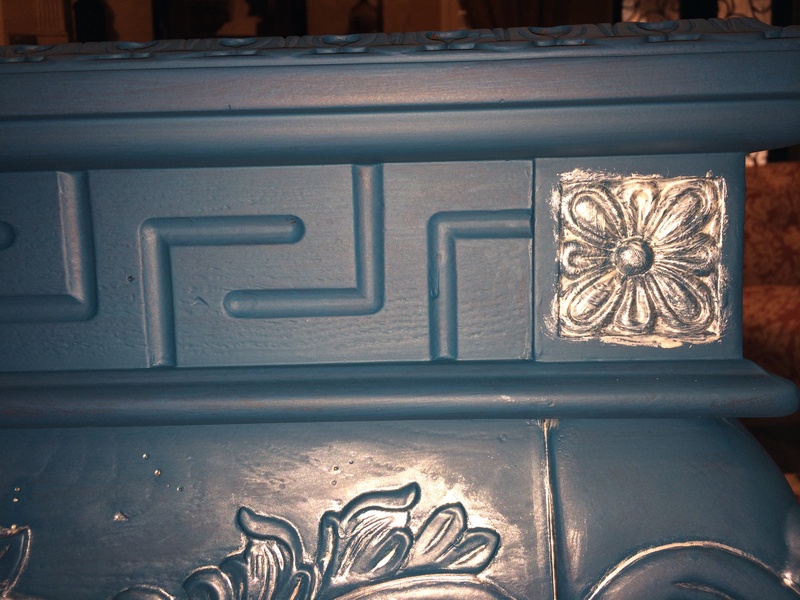 This particular piece I bought from Craigslist from a furniture staging company. 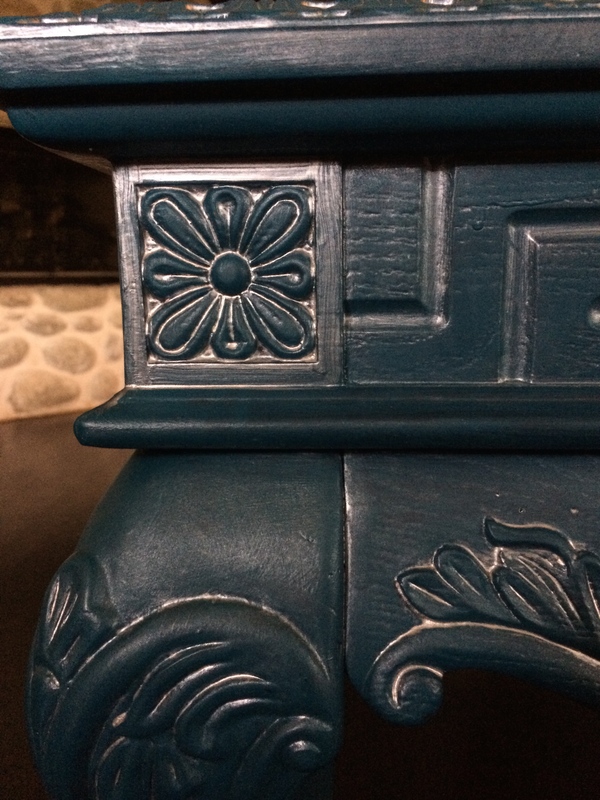 It’s built on a wood frame so it’s very sturdy, but it seems to be made of some sort of molded plastic for all the decorative carvings, and the top of the coffee table was like some sort of fake leather with nicks in it. I knew I planned to paint it with home made chalk paint since it would adhere nicely to the weird plastic-like molding. But I didn’t know what I wanted to do with the top, since it had the nicks in the fake leather. It still wouldn’t look nice painted. I was getting antsy to finish the piece that was sitting in my living room and not matching anything else, however, so I decided to rummage through my house to see what I could use for the top. The final secret touch? Aluminum foil! The heavy duty kind. I know it sounds crazy, but this is the most talked about piece in my house when people come over. EVERYONE loves it and nobody can believe I slapped some aluminum foil on a table and had it turn out awesome. I don’t have a true Before pic. I always forget about taking one until I’ve started a project. 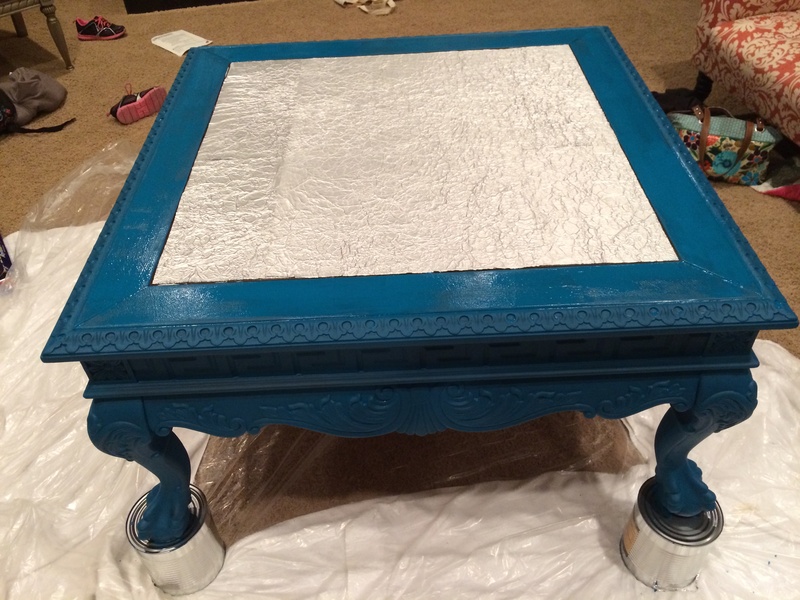 I was also super prego while doing this and my husband wasn’t home, so I lifted up one corner of the table at a time and set it on #10 cans and slid a painting drop cloth underneath and painted it right in my living room. I experimented with how much crinkle I wanted in my foil. You cannot ball up the foil and hope to unwrap it nicely crinkled. It will rip. I had to hold large sheets of the foil and just lightly squeeze my hands all across the foil to get this crinkled effect. 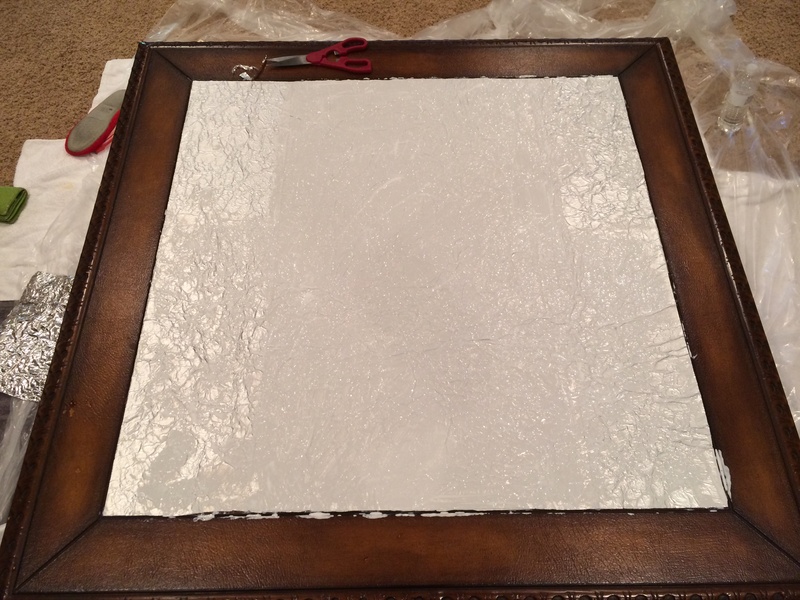 Once I had a large crinkled sheet, I applied it to the table with Mod Podge. With a paint brush, I modpodged just the area where the one sheet I was working with would cover and quickly laid the piece of foil on top of the modpdged area. I gently pushed the foil down everywhere and then modpodged on top of the foil. You can see the foil when it overlaps, so you’ll want to keep that in mind if you plan to foil something. I chose to to have a large piece of foil on the top of two smaller pieces of foil that were on the sides. I wanted as few seams as possible. The color was very bright and beautiful but it didn’t show off the gorgeous carvings very well. I wanted to help tie in the bright silver foil, so I glazed the carvings with Martha Stewart metallic glaze in Mercury. I thought I could just do the carvings with the glaze, but the glaze leaves a metallic sheen even after you wipe it off so I ended up having to rub it on the entire table and wipe it off so that it had a uniform metallic sheen and extra glaze in the carvings. You can see in the left pic below where I first applied the glaze, I applied it thick into the flower carvings, but there was no glaze yet on the rest of the table. The pic on the right was after I realized the glaze would make the whole table shimmery so I had to apply the glaze everywhere and wipe it off to keep the same effect. I brushed the glaze on with a paint brush and wiped it off with one of my husband’s old t-shirts he wouldn’t miss. There are a lot of terrible reviews about Martha Stewart’s metallic glaze. Don’t believe them. The problem is it does take a ridonkulous amount of time to dry. But it’s beautiful and so easy to work with. 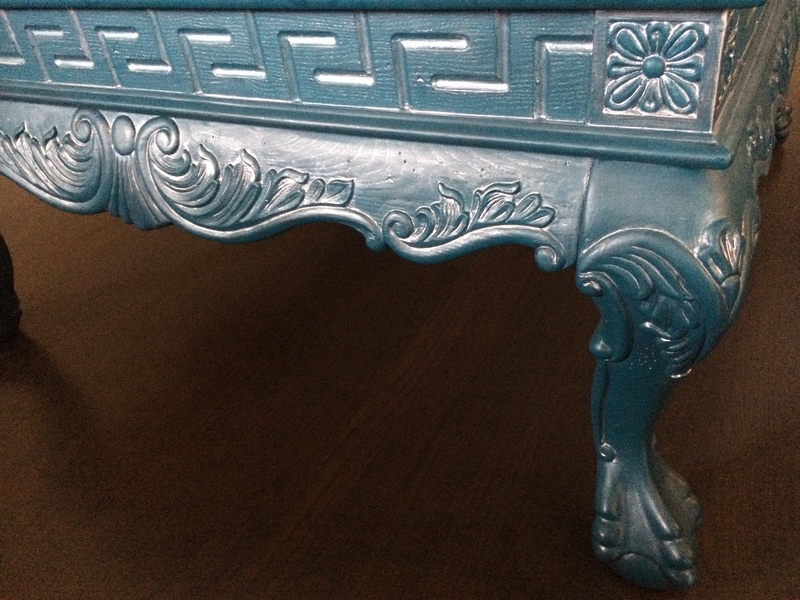 I have an end table I painted with the glaze and it’s gorgeous. I’ll be posting that later. But it took about a week to dry. Literally. 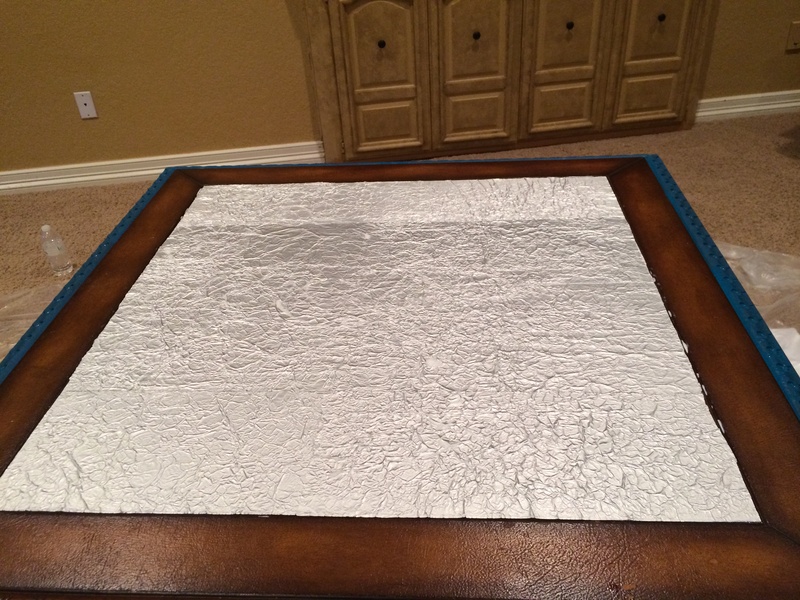 So what do you think about an aluminum foil table top? I’ve thought about getting glass cut to protect it more or pouring epoxy on it, but all the epoxy tutorials talk about using flame throwers and stuff. Not sure I’m up for that. It’s almost a year old in these finished pics, however, and it’s held up beautifully. I usually wipe it clean with baby wipes after my kids spill their food all over it. I also had my sweet husband add a decorative molding along the edges of the foil to help give it a more finished look than just a cut line of aluminum foil. We just secured it with some liquid nail and put heavy books on it until it was set and then I painted and glazed it as well. Leave your comments and questions below! « Mmmmm Mmmmm Monday! Gluten-Free, Dairy-Free Meatloaf! Haha, thanks Tasi!! And you do need to move back here and teach me how to cook and teach the teines to dance!! That came out sooo cool. I love it. I have used the clear epoxy and got the bubbles out by blowing thru a straw. It sounded harder than it was but i covered a table top about your table size and it took a large box and was expensive. I like it though. Thank you! And that’s interesting about using the straw! I’ve never heard of that! I’ll have to look into it. Thanks! !